An early memory of going to the Arsenal is when I went with my friend George to see Arsenal play Nottingham Forest. 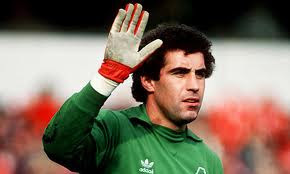 What was notable about this game was that Shilton had been involved in an incident involving his car and a woman. This lead to the chant “Shilton hit a lamppost, Shilton hit a lamppost, la la la la, la la la la” This refrain rang out from the North Bank. My friend and I squeezed in near the front in a good position to see the Marching Band, and in particular, the Band Leader hurl his mace in the air and unerringly catch it; as he did on all four sides of the ground at Half time. As I recall the Keeper in question fumbled a save that gave the Arsenal a win. The thing about the game in question was that it was a case of turning up at the ground buying a reasonably priced ticket and going in to watch Arsenal play a big club, which Forest were in those days. As for the year? I'm not sure but I’m sure a bag of chips followed. "Get them to sign on the line that is dotted"